At one point or another, most runners experience an injury. Because most of the propulsion in your stride comes from the muscles in your calves, they're especially susceptible to injury during a run. Your lower calf includes the soleus muscle, which can be injured through overuse or a tear, and achilles tendinosis and microfractures are common injuries that center around the lower calf. Preventing these types of injuries before they occur with good form and proper footwear is the best approach. Your lower calf contains most of the important muscles, bones, tendons and ligaments that make propulsion off of your forefoot possible during a run. The soleus muscle is the main muscle in the lower calf, extending from the base of the larger gastrocnemius at the top of your calf to the base of your heel. This muscle is key for plantarflexion of the foot, which increases the angle between the top of your foot and your leg. Your soleus also maintains your posture with a constant pull; without it, you would fall forward. Some soreness after a run is normal, and it heals after a couple of rest days. However, prolonged soreness could indicate a soleus strain. Strains to the soleus are rare and usually mild, and they may consist of pain, tightness and stiffness that worsens with use. 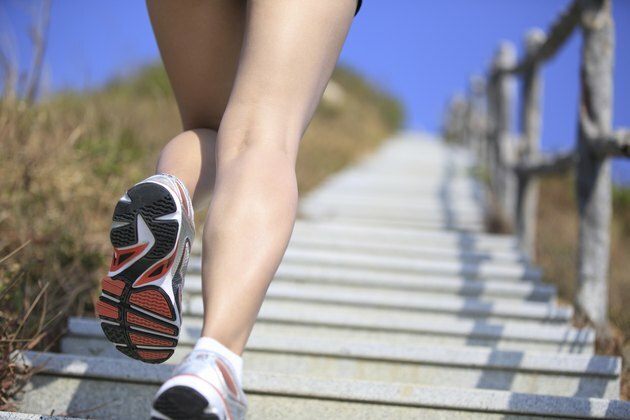 The soleus is not particularly susceptible to injury because it's a slow-twitch muscle. The gastrocnemius at the top of the calf is a fast-twitch muscle and is the source for the majority of muscle injuries in the calves due to running. Achilles tendinosis consists of pain and stiffness in the achilles tendon, which runs from the base of your heel up to about the middle of your calf. This tendon is attached to the soleus and is the thickest and strongest tendon in the human body. Such injuries are common in runners and usually require treatment by a physician. Your lower calf pain also could be a microfracture in the outer cortex of the bone. These injuries heal as the body produces osteoblasts to replace the damaged bone, but this process can take several weeks. Running during either of these injuries can worsen them, so don't ignore your prolonged pain. Very serious calf injuries may result in compartment syndrome, where extreme swelling of the muscle prevents blood flow. Compartment syndrome is characterized by swelling in the anterior portion of the lower calf, and it requires immediate care to avoid necrosis in the surrounding tissues. Such injuries are rare in runners, normally resulting from a fracture or crush injury. Chronic compartment syndrome is a less severe but physiologically similar condition that is not dangerous and can be treated simply by taking a break from running for a few days. You can circumvent these serious injuries altogether with a responsible running routine. Warming up before your run with a brisk walk or dynamic stretching prepares your muscles for the workout ahead of you, and a stretching routine on your off-days helps your muscles rebuild and recover. Minimalist footwear, which uses less padding in the heel and forefoot, encourages the strengthening of muscles in your calf and foot that stabilize you during your run and absorb impact. Stronger muscles prevent injuries in your lower calf and elsewhere, such as shin splints and gastrocnemius injuries. Scientific American: How Do Stress Fractures Develop? Could My Running Insoles Make My Calves Burn?